Essential oils for old dogs, if used correctly, can enhance the health and quality of life of our golden oldies. On the other hand, if used incorrectly, it may do more harm than good! That’s why it is so important to learn the basic before we try to use essential oils on our dogs. This post is about using essential oils on old dogs. In my other articles (this and this) I have talked about how to use essential oils properly and safely on dogs in general, and some precautions that come with using EOs on small animals. The question that many people with senior dogs is, how about essential oils for old dogs? Are they safe to use? The answer is a conditional yes, with extra caution! Old dogs, like older people, are more “set in their ways”. They don’t like changes and some may not appreciate having oils put on their bodies or novel smells around their surroundings. If you are going to introduce essential oils to an old dog for the first time, you need to do it slowly and with caution so as not to stress out the dog – that would be counter-productive, wouldn’t it? Let the dog smell the oils and see if she “approves”. If not, don’t force it onto her. Only use the oils that she doesn’t turn her nose away (or run straight out of the room!). Older dogs also have more sensitive skin, so if you plan to use essential oils on them topically, proceed with care. Use gentle oils (definitely no skin irritating oils). Don’t apply oils near the dog’s face. Don’t apply oils where the dog can easily lick them off. All of the above actually apply to any dog that you want to use essential oils on, but it is especially important to pay more attention when it comes to older dogs. Also, it’s sad but a reality that the liver functions of many older dogs are not quite up to par. Essential oils, once they get inside the blood stream (either via the skin or the lungs), will have to be metabolized by the liver. This could put extra burden on your older dog’s liver, especially if you use essential oils on her day in and day out. That’s why use essential oils sparingly on senior dogs, and try not to expose them to the oils on a regular basis (like every day). If your dog already has liver issues, I would avoid using essential oils on her totally. I would also avoid using oils on or around dogs who are prone to seizures. 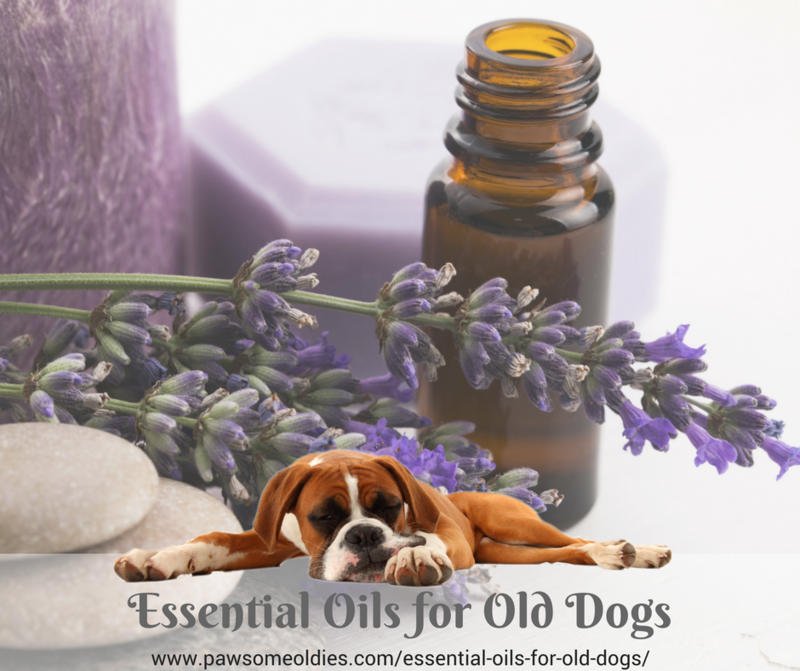 Essential Oils for Old Dogs – What are the Benefits? Now that we’ve got all precautions out of the way, let’s talk about how essential oils may help enhance your old dog’s wellbeing – both physically and mentally. It’s understandable that older dogs are more easily stressed. They may not be able to see or hear well, they may have joint pain… All these can definitely crank up the stress level. Worse, old dogs may have cognitive dysfunction (doggie Alzheimer’s). They may become disoriented, not knowing where they are, not recognizing some of the people around them… If that’s not stressful, I don’t know what is! 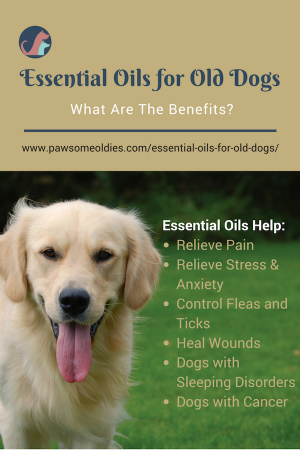 So if you think your pawsome oldie is stressed, has lots of anxiety, or doesn’t seem to be able to relax, consider using essential oils to help her. Insomnia goes hand in hand with stress and anxiety (and to some extent, cognitive dysfunction). If your older dog keeps you awake at night, you may want to diffuse some relaxing oils before bed time, and/or spray her bed and room with the oils as well (ask for her permission first). Essential oils are excellent in soothing pain caused by squeaky achy joints, muscle tensions, and so on. I would say many dogs over 8 years of age have some form of joint pain or muscle tension. To help lessen the pain, diluted essential oils can be used to massage the joints/muscles. Don’t know about you, but I certainly don’t want to use chemical laden flea/tick controls on any dogs, and definitely NOT on old dogs. Depending on where you live, and how much time your older dog spends outside, sometimes essential oils alone can do the job in warding off pests from the dog. Some essential oils have amazing skin healing properties, and can be used to help fight infections and speed up the healing process. While there is no scientific proof that essential oils can help treat cancer (and we shouldn’t use the oils for that purpose by the way without consultation with a vet), essential oils can be used to improve the quality of life of dog cancer patients. For example, we can use essential oils to help relieve stress and pain caused by cancer. 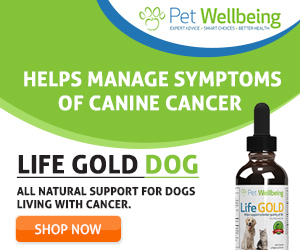 Sometimes dogs under going chemotherapy can suffer from side effects, such as vomiting and nausea, and essential oils can be used to help lessen such effects. 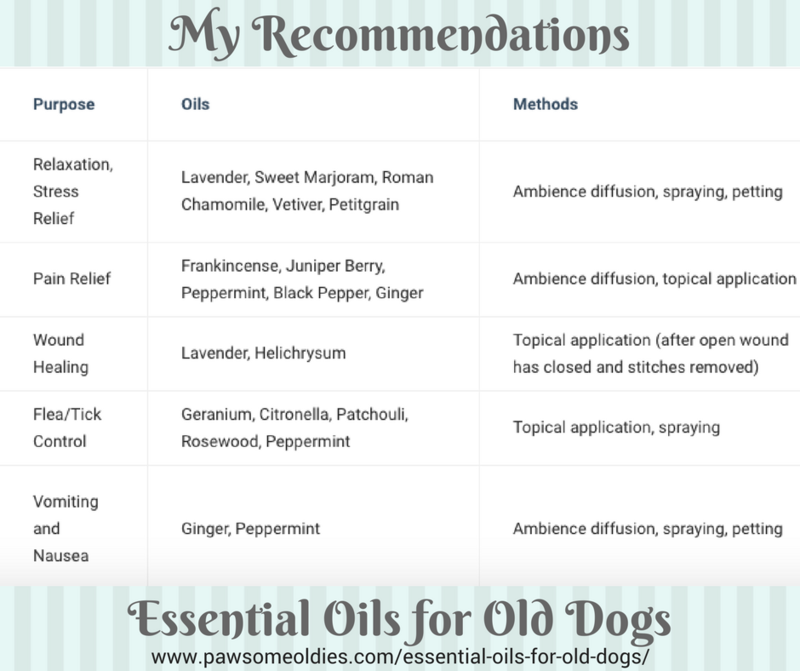 Essential Oils for Old Dogs – How To Use? If you have a diffuser, you can diffuse different oils for different purposes (e.g. relaxation, fight insomnia). When diffusing, do not overdo it as research indicates that even people can develop adverse reaction by intense inhalation through diffusion. Dogs are more sensitive to scents, so if you are diffusing around your dog, let the diffuser run for 20-30 minutes and pause it for at least the same amount of time. Do this 2-3 times a day and that should be enough. Essential oils with pain relief properties can be diluted in a carrier oil and used as a massage oil blend to soothe the old achy joints, muscle tension, spasm and/or strains. Put a few drops of diluted essential oil/oil blend on your palm. Rub both hands together to evenly distribute the oils. Then use your “well-oiled” hands to pet your dog. 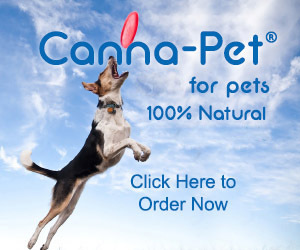 The aroma and the physical contact will relax your dog for sure! In addition to using a diffuser, you can mist spray the air. Add 10-12 drops of essential oils to a 120 ml (4 oz) mist spray bottle filled with water. Shake well and spray the air around your dog, the dog’s bedding areas, and so on. As you can see, there are different ways to use essential oils safely on old dogs. While the oils recommended here are considered safe for dogs, do remember that all dogs are different, and they may react differently to even the same oil. So, when using an oil on your dog for the first time, it is important to observe the dog closely. If she shows signs of stress or discomfort (e.g. panting, restlessness, sneezing, skin reaction, etc. ), get her away from the oil immediately.